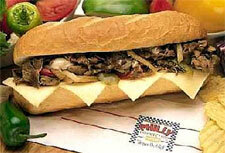 For over 15 years, Philly Connection has served its award winning, freshly grilled Philadelphia Cheesesteak Sandwiches using its special marinated steak that is 90% lean and never grilled with oil. Philly Connection also offers a full line of hot & cold sandwiches, salads, fries, chicken tenders and more - always made to order. Only the highest quality ingredients meet Philly Connection's menu standards and the upscale trend of today's customers. Headquartered in Atlanta, Georgia, Philly Connection locates its restaurants in leased space in strip shopping centers, free standing buildings shared with other national brands and anchored shopping centers with major retailers such as Kroger, Publix, Home Depot, Lowes and Wal-Mart. Drive-thru locations are acquired when available. Be a part of this rapidly growing quick-service restaurant franchise concept and become part of the fastest growing segment of the food industry - Quick Service Restaurants (QSR). Join the Philly Connection network of franchise owners and be in business for yourself but not by yourself. To learn more about the Philly Connection food franchise opportunity, simply complete the form below.